It has been a long standing policy of our committe that we seek to support and learn from the ongoing natural recovery processes that are happening in the park. Very little direct restoration has been done in the park by the city, other than capping the old dumpsite with dirt. Almost all the trees and vegetation in the park now have grown up naturally. There are healthy areas of the park, and some areas where first generation trees are being choked out by invasive species. 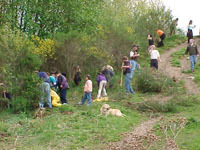 We try to organize maintenance efforts, tree plantings and sensitive habitat restoration in such a way as to support ongoing natural restoration, as well as human recreation, and to create better and richer habitat for birds and animals. This has been our approach in all our dealings with the city, but at the same time we hope to see more effective and comprehensive restoration in the future.To this end, committee members are working closely with a Parks Board horticuluralist (Bill Stevens) to organize the tree plantings and removal of invasive species (Japanese Knotweed, blackberry, Scotch Broom) in small trial areas. After these are removed, wood chips are spread and small potted firs and evergreens are planted by volunteers. The chips and trees provide a barrier to encroaching blackberry, and we try to create open meadow spaces. 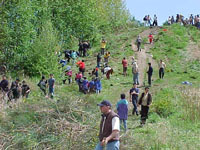 The first trials of this method have worked well and we hope to do more.On a larger scale, the 2003-2005 Capital Plan of the City of Vancouver includes a $60,000 item which will support a consultant who will develop a full community vision for the future of the park. This document will be used to help develop a full and long-term management plan for the park (something the park has never had). It is likely that natural restoration will be a big part of that document, and we hope that critical issues of tree succession and park biodiversity are addressed in the document.